15.Oct.02 - Office-closure-event at the IOM-Office BerlinTo start off the International noborder-Action-Day approximately 70 people visited the office of the IOM (International Organisation of Migration) Berlin, Inselstr. 12 today. 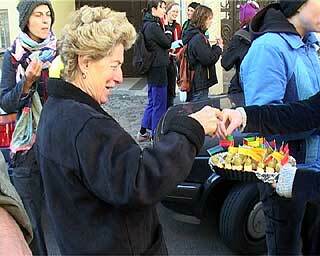 While snacks were served and music was played the visitors declared the office as closed. 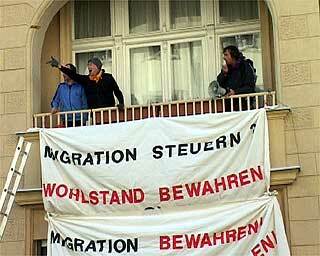 Several people climbed on the IOM's balcony to enroll banners (see picture) and to offer the IOM help to move out. At the same time a delegation negotiated with the IOM's twelve staff people inside. Unfortunately the action in Warsaw happend on the first day of snow, so the weather messed up the action a bit. Information and leaflet were distributed the stadium in Warsaw where there is a large market where many foreign people sell goods. The weren't as many people around as usually due to the miserable weather. It became obvious that a few foreigners from the ex-Soviet Union didn't even know about the coming visa regime so the informations prooved to be quite useful for a mumber of persons that were present at the market. The stadium was decorated appropriately the night before but the snow rendered certain elements barely visible. But surely people will begin to notice certain slogans and, like with any advertisement, we expect people to recognise them soon and hope to spread them around the country. 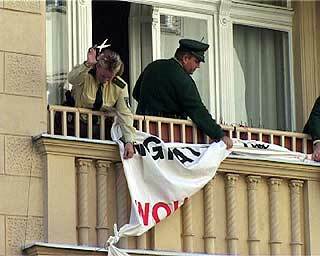 In any case, the activists had a few gadgets with ants on them --- foreign traders are known as ants in Polish slang ---and they are quite popular. News of the ant campaign has already spread a bit among activists and it is hoped that it will become a trendy item amongst traders. 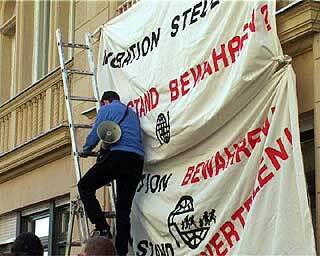 Today, on 11. october a small demonstration "against global migration management - for the freedom of movement" was organised in Vienna. About 25 people and the bus of the PubliXtheatrecaravan joined. Meeting point was the place where the ICMPD has its office. The ICMPD is, like the IOM, an important international organisation in migration management. 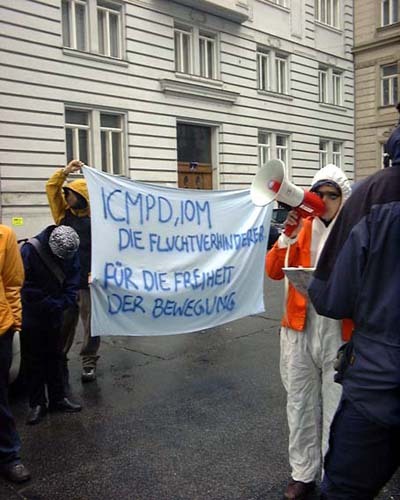 The demonstration went from the ICMPD office to the IOM office and finally it was announced, that we will come back. Last week the Platform for a world without racism got a letter from the ICMPD office. It was an invitation to discuss about migration. We are thinking about a public discussion, its not clear now. 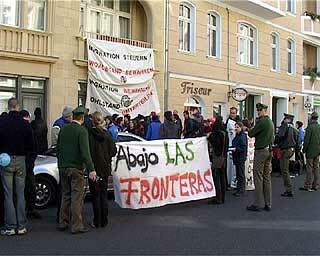 The International Organisation for Migration (IOM) office in Helsinki, Finland, closed its doors to both customers and demonstrators today, friday 11.10.2002. 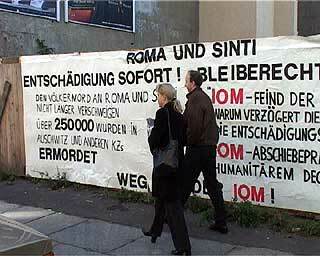 A notice announcing that the office would remain closed all day, attached to the front door of the office, was the only "dialogue" the IOM would offer to protesters, even though staff could be heard moving inside. Even before 3pm people were already blocking the bytes of this times target: www.aile.it The call for action was spread and received with enthusiasm: lets do these things more often. But the real fun started when at 3 pm the shity server started to slow down and after an hour I gave a white page you could not see the site any more! if not in occasional moments- for a few hours: target hit! The amusing thing is that the strike went longer than we expected, most people came during the time that we had launched, others came after and continued the strike until 7:30pm. At 7pm, instead of the home page, only the writing 'Sito in allestimento' (Site under construction). This immaterial border origin of who knows how many divisions, exclusions, deportations and the efficient device for the new slave-traders is controlled under the clicks of those who would love to see that frontier disappear and it seems that today the web site still hasn't regained life, if you go on www.aile.it instead of the home page you will find: 'Sito in allestimento' (Site under construction). For the moment one less border ;-)) Another curiosity: during the strike a group of participants affirms that certain files .doc, that you can download from www.aile.it with information's on them, were instead were infected by a macro-virus. The files were passed through many different antiviruses and they all revealed the same worm. NOBORDER(A)CTION 4 FREEDOM OF MOVEMENT: WWW.AILE.IT GAME OVER!